Police in the US state of Ohio have arrested four men suspected of assaulting a 74-year-old member of the Amish community. He is one of several Amish people in the state who have had their hair and beards forcibly removed in apparent efforts to humiliate them. Jefferson County Sheriff Fred Abdallah said two more people were being sought. Suspicion has fallen on a breakaway Amish group rejected by the mainstream community. The Amish, who call themselves the Plain People, generally shun modern conveniences such as electricity, televisions and cars. The 74-year-old man was attacked at his home in Holmes County on Tuesday night. Over the past three weeks, at least six Amish men and women have been assaulted in four different counties, losing their beards or, in the case of the women, clumps of their hair. In religiously conservative Amish communities, women do not cut their hair and men grow beards only after they marry. 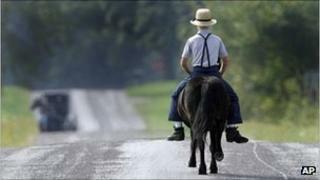 The BBC's Paul Adams in Washington says the attacks appear to target cherished symbols of Amish identity. He says what makes the attacks so baffling is that they have been carried out by fellow Amish, apparently members of a particular clan from the town of Bergholz in rural eastern Ohio. The feud is thought to involve 18 Amish families, most of whom are said to be related. Officials have said investigations were being hampered by Amish reluctance to seek police help.